This is a folio of photos and correspondence sent by Pedro Dot to Ralph Moore decades ago. I will be scanning these documents and formatting them into an article soon. These photos are unique and of great historical importance. I look forward to making them available to my readers. 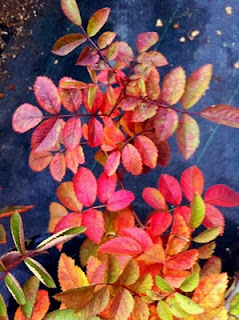 Another seedling showing great Fall color. This is a cross of (R. foliolosa X Little Chief) X Therese Bugnet. The foliolosa hybrids seem to have the best Fall color of all. This is one of many various crosses using R. foliolosa that is starting to show exceptional Fall foliage coloring. What a nice trait to include. People seem to be unaware of the fact that roses can provide seasonal features beyond bloom color. As the years go by, you encounter many aficionados of The Rose who introduce you to some very curious things along the way. 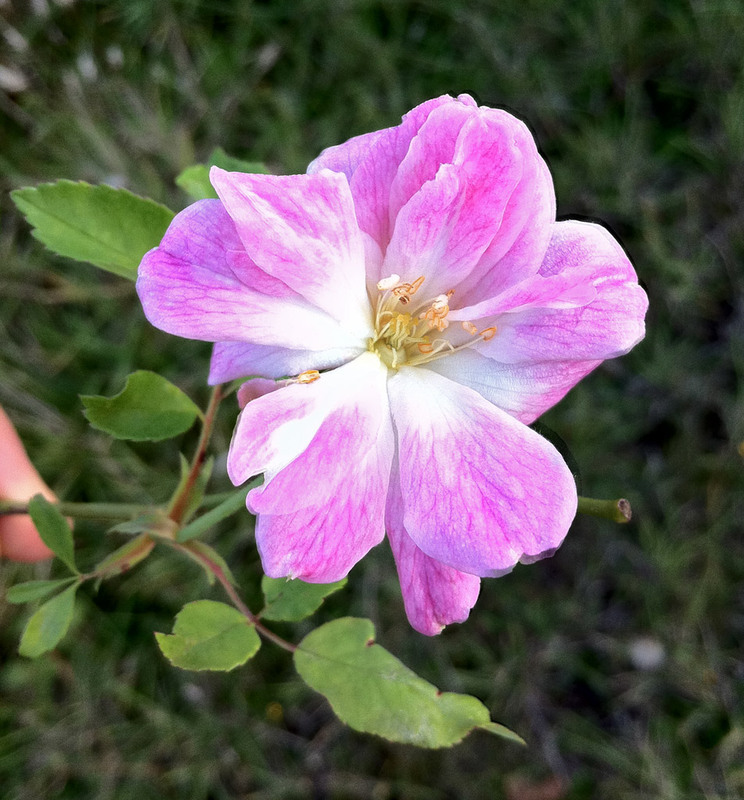 Certainly Ralph Moore has shown me, by far, the greatest number of rose oddities and today I want to introduce you to one of these. 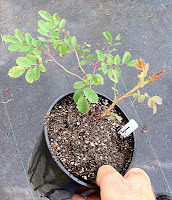 This is the Reversion Sport of The Green Rose, R. chinensis viridiflora. It was discovered by Moore at Sequoia Nursery many years ago, growing as a lone branch on his mother plant of viridiflora, bearing semi-normal pink blooms. It doesn't always make such "regular" looking flowers as you see here; often they are halfway between normal and the odd green sepal formation of viridiflora. When they appear as ordinary pink China blooms, they are at their best. As you can see, the Reversion Sport does produce normal reproductive parts, and in fact the plant will set seed if allowed to. (I don't recall whether these germinate or not, but I'm sure I have sown the seeds years ago) The appearance of this sport lends credibility to the supposition that viridiflora sported from 'Old Blush' at one time. Perhaps that's true! Curious, eh? Having difficulty propagating a particular variety? Got a rose that refuses to be propagated by cuttings or other means? You may want to try this approach. I have a number of plants that have proven very difficult, if not impossible, to propagate by softwood cuttings during the growing season. 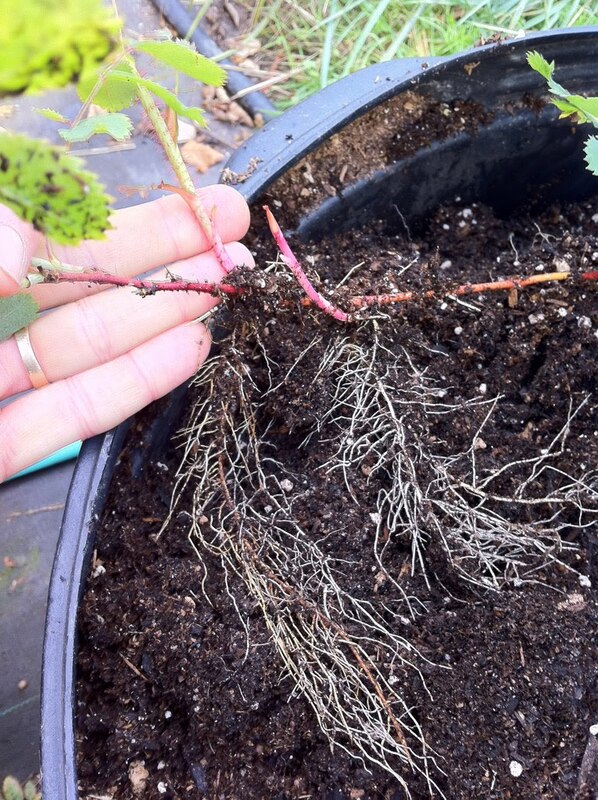 A number of roses either lose their leaves immediately when cuttings are placed in the misting bed, or the stem turns black the moment it comes in contact with the rooting media. I've played around with alternative methods and found one very effective for most any rose: layering. Well, its a kind of layering. 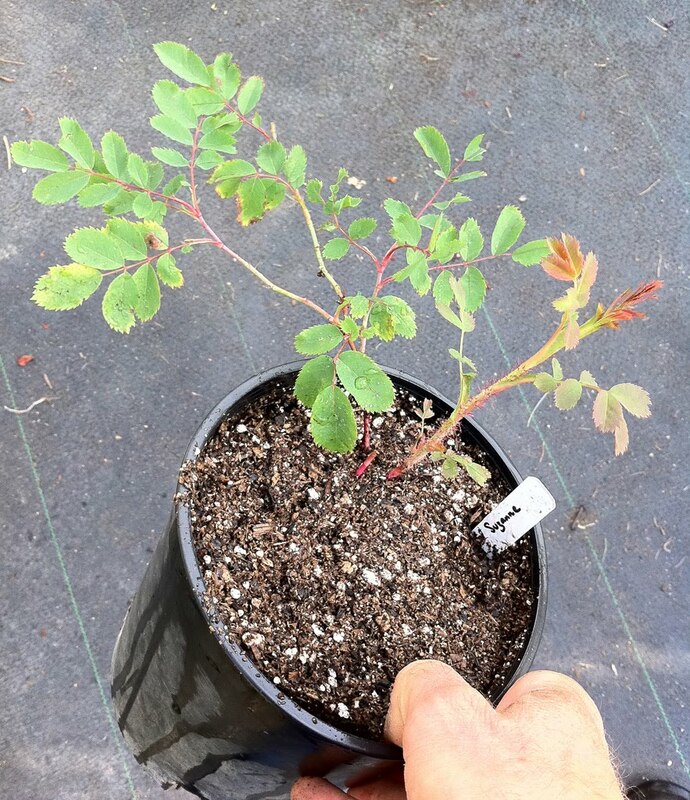 I take any cane of a rose that can be bent to reach the soil surface (plants in pots or in the ground, either works) and bury a section of the cane under the soil, leaving a few inches of the growing tip exposed. I do not injure the cane in any way, nor do I use rooting hormones of any kind. In fact, the whole procedure is a rather lazy one; I just grab a cane when I happen to be near a plant I want to propagate, paddle out a bit of a hole in the soil surface and shove the cane in and pat it down. Nothing could be easier. In most cases, I found that these cane were rooted enough to remove the shoot and pot it up in four to six weeks. Shown here is a shoot of the Spinosissima 'Suzanne', five weeks after pushing the cane into the soil. 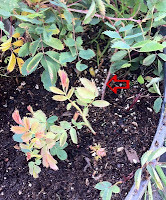 In the top photo, note the red arrow in the photo which is pointing at the original cane that was pushed under the surface, at just about the point that it enters the soil. Click on any of the photos to view a larger image. 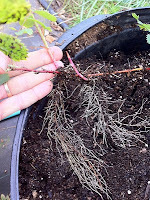 You can see that it has not only produced a significant root system of its own, it has pushed up new shoots from below the soil surface to start forming a brand new mini-thicket of its own. The shoot was cut from its parent cane and potted up in a gallon can, as you can see here. It did not suffer any transplant shock at all (bear in mind I dug it on a cool, cloudy day) and appears ready to make a go of it. What could be easier? !